As soon as I got my LX3 I wanted a case for it. The whole back is taken up by a spectacularly bright screen that screams to all sharp pocketed objects, “since there isn’t an ipod around, scratch me instead”. No bother I thought. “I’ll just pop along to my local camera store, Currys as it happens, and peruse their pretty large range of compact cases; nope! Nothing fits the LX3 in any reasonable way and they have about 10 compact cases. The problem is that although the body is smallish, the lens is permanently sticking out, meaning you need a fairly thick but still small case for it. Next step, on my first evening of ownership was to go to the websites. I liked the Panasonic custom fitting leather cases, but they are expensive, and no-one actually seemed to have UK stock. I loved them though, they add to the retro look of the camera, like a rangefinder case from earlier days. Next stop, as I didn’t want to order one from Japan, at £70 plus posting was the Lowepro site. This has a helpful PDF file listing the LX3 and telling you all the cases that fit the camera. They also gave the dimensions of the interior. I measured the required dimensions to accommodate the slightly fuller figure (in compact camera terms) of the LX3 and discovered that they were lying, almost all of them were too flat/thin to take the protruding lens. Next day I went to Jessops with my LX3 in its protective polythene wrapper and tried another 10 cases, none of which fitted, including one which is offered by Jessops in an online bundle deal with the LX3! Finally success, I found only one, the Lowepro Apex 30 AW. I bought it there and then. My camera was now protected, and these cases are well made and include belt loops and shoulder straps for hillwalking etc, and this case would be ideal for that purpose. It still felt a little bulky and of course had to be taken out of the case to be used. 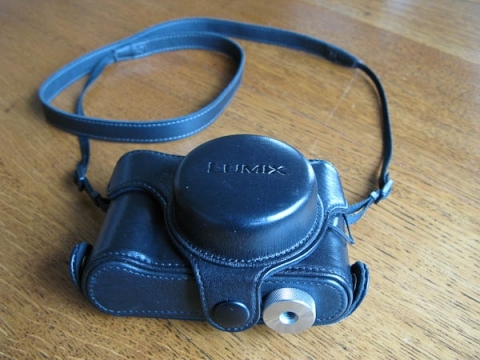 The fancy Panasonic Leather one allows you to use the LX3 in the case. I looked again and found a UK dealer over a December weekend who took my payment and promised to send it next working day. So do I like the case? I’ve used it about two weeks and I love it. It slips into a pocket neatly, as long as its a jacket pocket, it slings over a shoulder nicely if you have no jacket, it looks fantastic and you can even attach it to a tripod without removing the case. When you need to remove it, one simple screw into the tripod socket, which has an aluminium finger wheel is all it takes. It’s expensive, but it is really well made and wraps the LX3 in about as small a space as you could manage while still offering physical protection. Wouldn’t it be nice if manufacturers actually gave us a case in the box? I wonder how many people scratch these screens before they get one. Now note the natty built in raincover, perfect for outdoor types. Remember this is a perfect handheld landscape camera with it’s 24mm lens.